My boss and the guys at HR coaxed me into participating in the seven kilometre fun-run part of the Delhi Half Marathon. The last time I ran amidst a mass of people was back in school, though I have walked for considerable distances, running is something that I didn’t pursue much. A few friends had got together and planned for a daily morning jog back in college, but the daily chases by mongrels on the sloping roads of Shillong was deterrent enough to keep us wrapped in quilts till the sun was high enough (That we were lazy was inconsequential before the canine excuse). Prior to this mini-marathon, I had trained myself for a few days. Basically it meant two rounds on a flyover near my house. And the first day it ached and ached for days. Today to the calves are a little sore. But it was a fun run. And it is fun to run, especially when you have characters out of mythology for company [see pic above right]. 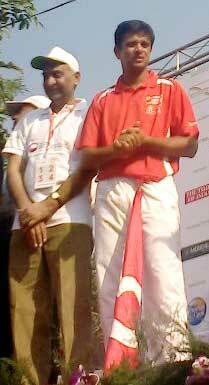 There was freshly out of the ODI-squad ex-captain Rahul Dravid to cheer me and thousands of others on [see pic left]. Speaking of marathons, I would recommend the exploits of two marathon runners that I had written about before. Meanwhile, I should rest my aching calves and feet.